This time of year means many changes afoot. Shifts in the landscape presently invisible will soon become material. 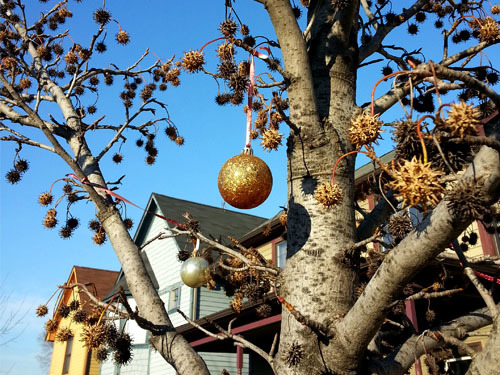 This is not just seasonal stuff — the mounting of abscission cells in tree leaves or the rampantness of squirrels or the odd autumnal deficit of acorns — unless you consider the tax-foreclosed property auction a season. And why not? 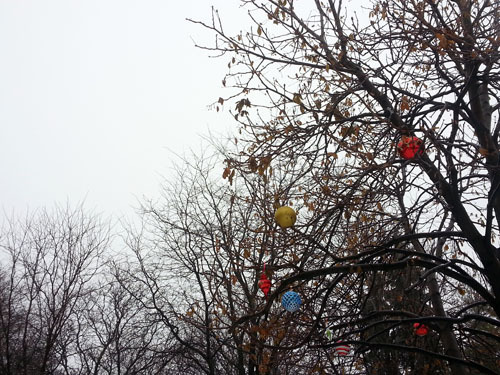 With all its expense and obsessive fervor, it’s about as festive. Bidding on the first batch of properties in the September Wayne County auction ended last Wednesday. Having it out of the way may be a relief to some new and returning landowners, but the suspense is still on. Sales for the last of this month’s properties will climax on September 24, making way for the shitshow that is the October round. In past years, waiting for the October auction has been a popular option, when bidding starts at only $500, rather than the full amount of back taxes owed on the property. Not so this time. There is a new urgency to snap up properties in some areas that can’t wait a day, let alone a month. What kind of shifts can we expect in the coming months as all this land changes hands? 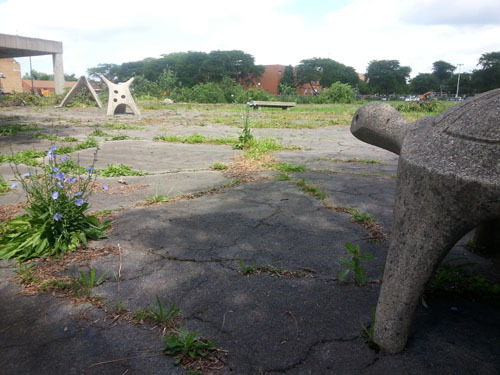 Amid such uncertainties, fewer of Detroit’s infamous fields is a given. Here’s a preliminary glance at the relative value of some of Detroit’s real estate. This former field along Woodward is part of the Pizza Empire’s new playground, served on a rent-free silver spoon by the Downtown Development Authority to the Ilitches for the new arena. (Hey guys — I hear gold spoons taste better. Try harder next time). While they Ilitches do not technically own this particular piece of land, they effectively control it in perpetuity, since the lease may be extend up to 95 years, at which point they’ll all be deceased. The city council controversially voted to sell the land, including this parcel and 38 others, for a mere $1 to the DDA earlier this year. In its former life as game-day overflow parking, the lot had a couple trees facing Woodward but little else to offer; walking this void between Midtown and downtown was bland, windy, and unpleasant. Now, the area is increasingly disorienting to traverse on foot and is anticipated to become more so, until there is a new arena in the middle of it and it is yet another field — and streets — that can no longer be walked. How will the new arena area compare? The placement of 52 shipping containers is underway as this week’s groundbreaking event draws nearer; it basically looks like some people have been playing with large red Legos for the past week. A couple of the containers are being outfitted with murals by VIP painting crews allowed past the perimeter fencing. Compare that field to this on Trumbull, home to a scrubby Japanese maple and a sign reading “No City Cut,” which just sold for $11,000. Who owns this now? A neighbor living in one of the houses next door? More faceless Vinyl Village development entities? The suspense continues as the treasurer’s office slowly mails out deeds and new owners appear. For perspective on that $11,000 field, also in this round of the auction was a parking space at the Park Shelton, which sold for $35,300. As hilariously noted in (and later removed from) the property description on the tax auction site, the winning bidder was ultimately foiled when the condo association told him the condo and its parking space could not be owned separately. City employees faced with this complaint just moved on, awarding the parking space to the next highest bidder. As the air chills and more land gets grabbed, we’ll be looking at — and walking through — other vanishing fields, to see what is lost and what is gained in the rapid transformation of the cityscape, dictated by the handful of powers with its future wrapped around their finger. Arenaland: if we keeps it 300%, we keeps it out of reach behind a fence, now. Utterly poignant and timely Detroit artists’ conversation on creativity in the present and future city, from its residents to newcomers “taking the plunge,” and the history of it all. It’s a whole new week, and there are still no crosswalks on Second in Midtown. This was actually only a minor bummer relative to the spectacle going on just west of the Canfield pedestrian bridge Tuesday afternoon. 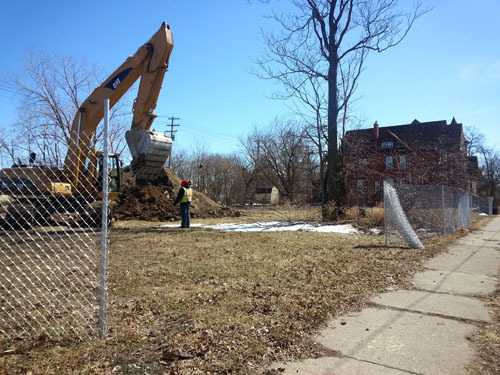 Crews of tree-trimmers were at work on the field next to the former Detroit Day School for the Deaf. The field was littered with trunks and limbs and leaves hither and thither. As I stood by, awestruck, a bicycling neighbor paused to offer some conjectures on the park’s plight. “I think they’re developing it,” he said, gesturing to the vinyl village of townhomes across the street. The field is used all summer for baseball games, and the adjacent recreation area, complete with quaint chess tables, concrete turtle, and pavilion, is a frequent site of big happy neighborhood barbeques. Personally, I’ve been enjoying my morning coffee with this turtle for the past nine years. 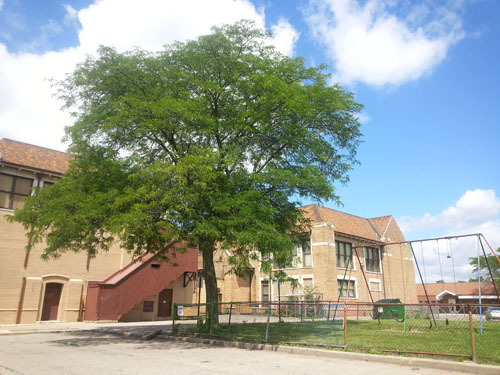 The 3.2 acre space is owned by Detroit Public Schools. “If they’re developing it, they haven’t told us about it,” said the kind DPS representative I spoke with, which doesn’t seem unlikely in the slightest. Permission? Forgiveness? Bah. Just some tree-cutting, she said, as though turning to mulch every tree on the property were a regular operation. “Maybe they have some kind of disease,” she suggested. The dozens of tall black locusts populating the field seemed to have been in perfect health. The tree crews from Highland had no information on their assignment. 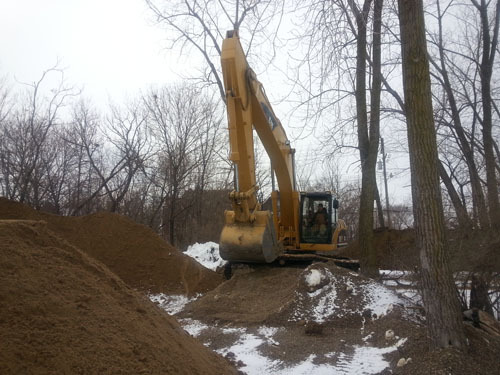 “They just told us to clear out the trees,” one worker said. 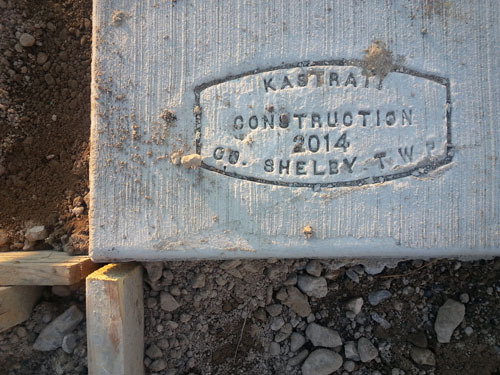 “Maybe they’re expanding the parking lot.” At least with these reductive operations, crews can’t leave their mark on Detroit turf as did the pavement-pouring outsiders who thought to imprint “SHELBY TWP” in Vinyl Village’s new sidewalks across the street. Guess we’re not in Kansas anymore. I feared the worst for this essential greenspace at Canfield and the Lodge, which could so easily go in the way of other recent problem parks. In a bright turn, rumors go unfounded. DPS leases the land to charter school Edmonson Elementary, which in turn leases an adjacent building to Woodbridge Community Youth. None of the three secretarial-types at desks in the Edmonson office had any idea that tree-trimming was noisily happening a few yards outside their door, but asking further, one employee knew of future work there. As we strolled outside Wednesday morning to see the ongoing devastation, he seemed excited to inform me that Woodbridge Community Youth has secured a grant for a new playground. 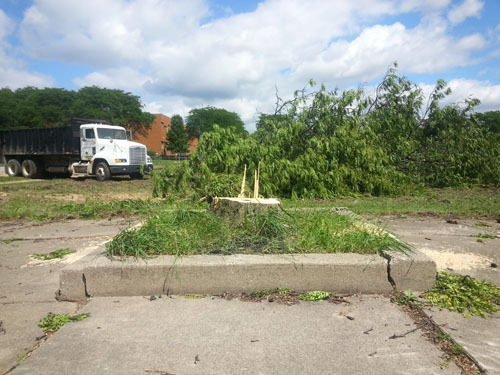 It’s unfortunate that these healthy, mature trees need to go so that new, kid-friendly nature can be installed, but the Edmonson Academy representative said the parking lot was actually projected to get smaller. The new playground is in partnership with KaBOOM!, a Washington, DC-based nonprofit dedicated to addressing the nation’s “play deficit” and “play deserts” by providing a place to play within walking distance of every child in America. Finally, some good news! No hints yet on when the project is expected to be complete. 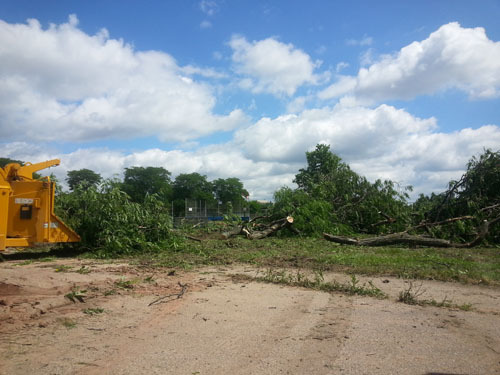 For now, tree removal crews will be out there “as long as it takes” to clear the site. Maybe they can use some of the resulting mulch on the new playscape, if real woodchips are an approved play substrate for the twenty-first century. Oh, just calmly watching the destruction of my habitat! This is not a fun game of who’s-got-the-turtle. A neighbor posting on the Woodbridge facebook group has unearthed this rendering of a new baseball field for the Woodbridge Eagles, set to be playable in August. Two weeks! But where is the playground? As the snowiest January on record drew to a bitter end and the news reported that even the middle class is now being priced out of apartments in highly desirable areas such as downtown and Midtown, construction crews broke ground just west of the M-10 the Lodge expressway in Woodbridge Farm, a historic neighborhood long feeling the push, if not the shove, of gentrification, or whatever you want to call it. Woodbridge Farm, a thin ribbon of land designated historic by the city and the National Register of Historic Places, spans Trumbull and Lincoln from Canfield to Grand River. It is not included in the larger Woodbridge historic neighborhood designation, a boundary some residents think may benefit from expansion. 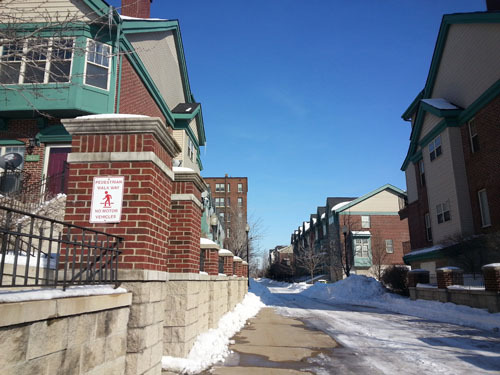 With only two houses standing on its northernmost block, the surrounding empty lots have no grounds for historic designation, and in come the developers. This was a field I’d walked through many times before. 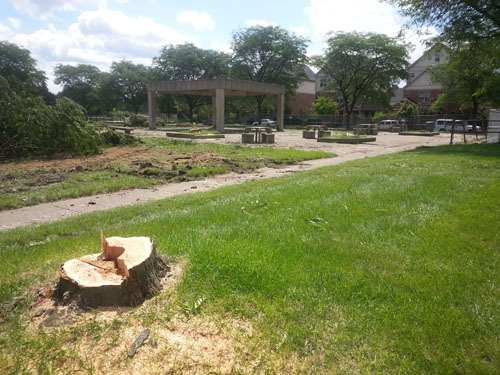 Residents were shocked, outraged at the sudden appearance of workers cutting down tall, old trees in the park-like greenspace where many brought their dogs to romp. As bulldozers arrived, calls to the historic commission yielded nothing to help stop the destruction. The lots are rightly owned by Scripps Park Associates, the firm behind Woodbridge Estates, an enclave of generic, vinyl-sided new houses and townhomes situated between the freeway and Woodbridge Farm’s eastern boundary. 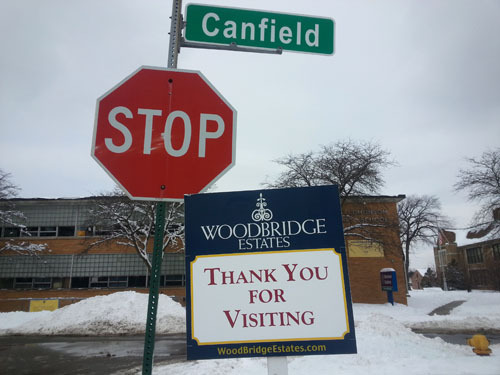 Woodbridge Estates will be filling the block with more shoddy rent-to-own duplexes. 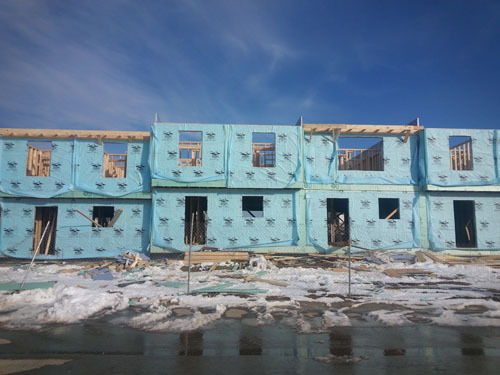 Residents complain that construction within the original footprint of the development, aptly nicknamed Vinyl Village, has gone too slowly, leaving foundations capped for years. Why uproot more ground elsewhere when a reasonable density there hasn’t yet been achieved? The expiration of building permits knows no common sense. So it goes in the city. One thing gets knocked down to make room for another. Soon enough few will remember the fields that were there, just as I don’t remember the apartment buildings that once stood, fairly recently, on the same lot. 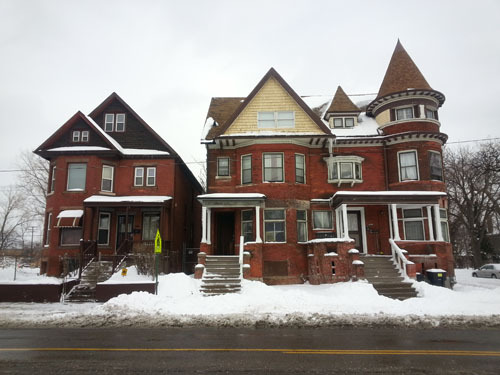 Change is good, or so implies the mantra many Detroiters hear and repeat: we need neighbors. But do we need the neighbors to live in depressing, identical drab beige structures? The staff in Woodbridge Estates’ rental office was unaware that the lots newly under development were in their jurisdiction until a grounds maintenance person wandered in while they were hemming and hawing. Overhearing our conversation, he exclaimed, “Yeah, I have to remove snow all the way up there now!” and directed me to the construction trailer, the nucleus of project operations. The trailer is warm and sunny, full of drawings and xerox machines and cold blueprints meting out what residents had thought was common ground. Nobody’s actually bought anything since 2007, the project manager told me on my third and most successful visit (on my second attempt, all but one worker had left shortly past noon to attend a retirement party). 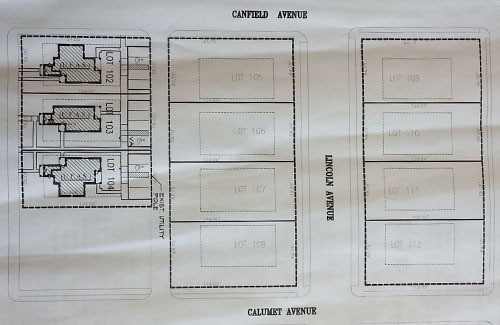 The project manager, an affable guy named Howard who lives in the cushy northwestern suburb of West Bloomfield, took time to talk with me about the duplexes, seeming genuinely curious that neighbors were concerned over the appearance of the planned buildings. When I asked about whether care had been taken to mesh the appearance of new housing with the existing neighborhood character, he said that they should match better than the ones standing in Woodbridge Estates, but that he didn’t have final renderings yet. In this case, he told me, the developer had asked the architect to drive through and pick out some paint colors that would be a better fit than their usual dirt-hued “neutral” palette. How strange, to begin construction when the people in charge of the project don’t even know how the buildings will look. 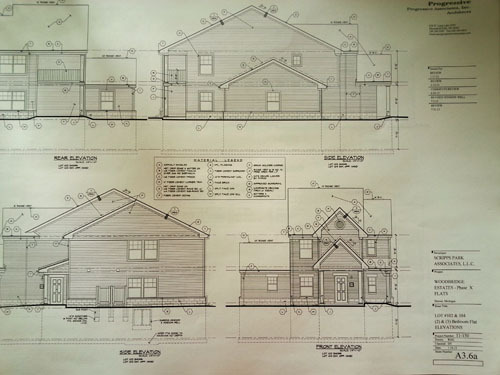 These lovely drafts are from Progressive Associates, Inc., architects based in Bloomfield Hills. Had he seen much of Woodbridge himself?, I inquired. He seemed surprised. “I’ve driven through it a couple of times, yeah.” Howard was aware of the two “tenements” on the block, a baffling word choice for the two historic homes, among others, that his company is working to emulate visually. Whenever I walk by at lunchtime, the street is lined with the shiny trucks of construction personnel, idling, each guy eating his lunch in solitude as few yards as possible from the jobsite. I wonder if they ever explore the neighborhood, wander through these fields they’re digging up, or if they return promptly to their vinyl-sided paradise, leaving the “tenements” out of sight and mind. Walking to Woodbridge from the venerable Cass Cafe during yet another snowstorm, I said to a friend, “Hey, we’re at Canfield already!” “You mean, more like Can’t-field these days,” he said as we looked at the stark structures newly rising from pits hollowed in the ground. 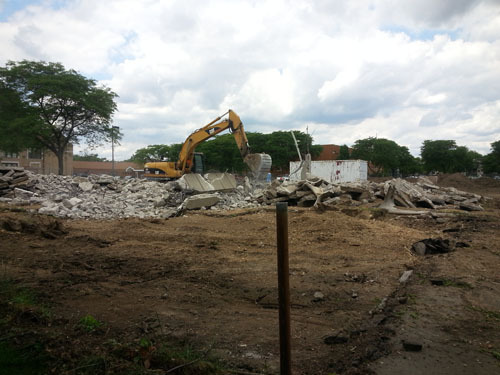 Perhaps it is just the way things will go, that all neighborhoods will have their own vinyl village, like elegant Brush Park with its unsightly rash of condos at the southern end. 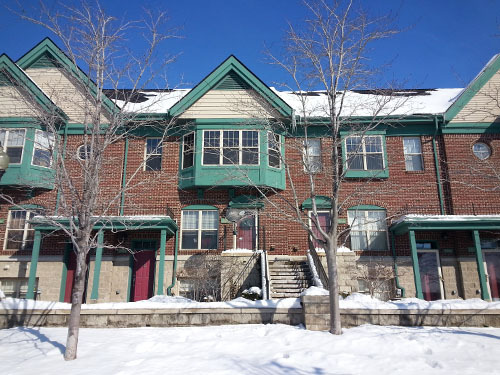 “With its suburban appearance and barren surroundings, the Woodward Place condo development isn’t exactly the pinnacle of the Detroit rental scene. Near so much architectural glory, many overlook the units in favor of something more loft-like,” says Curbed about one of the first and most successful developments near downtown. Even MOCAD is absurdly accompanied by its own vinyl ghost, the unfortunate Mike Kelley replica ranch, little more than a mean jab at Detroit’s citizens and circumstances veiled as a really exclusive library. To someone, this type of development must be voluntary, even desirable. Who? If only they all came with pedestrian walkways! Watching the greying heads of the supervisors at the Woodbridge Estates jobsite, it doesn’t seem like a far stretch to speculate that these are the structures admired by an older generation, the people who fled the city and built burbs full of McMansions. As renovating old commercial spaces into airy lofts and rehabbing historic residences to their former grandeur has smitten my generation, it’s curious that buildings like these continue to go up. Will future generations see these repetitive, uninspired houses as something to cherish and protect, the way we feel about older, more architecturally-rich ones? Is it all a matter of perspective, or worse, fashion? It just seems that we can do so much better than this. Why can’t more infill housing look like Briggs, where houses built in this century have, if not some of their own charm, then a neighborly benevolence toward the older structures with which they share blocks? They can. But with the plans already in place, what can be done about these lots? What can be done to protect other blocks in our neighborhoods from the dubiously-motivated interests of wealthy men from the burbs? For the past month, the construction equipment has been parked in the middle of the field that once was, abjectly motionless, surrounded by mounds of dirt. On the remaining fringe of land, people still come to play fetch with their dogs. It’s hard to complain; Detroit certainly suffers from no dearth of fields yet. 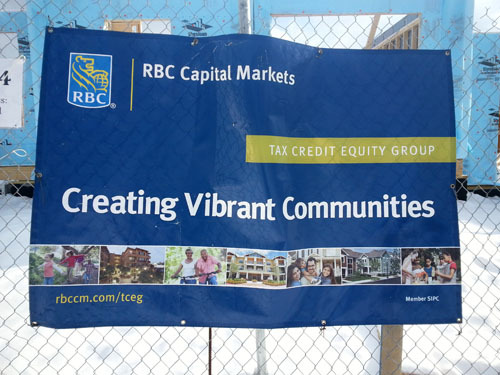 It’s ironic that the neighborhoods regarded as disadvantaged by most other measures become the envy of those receiving such well-monied attentions. 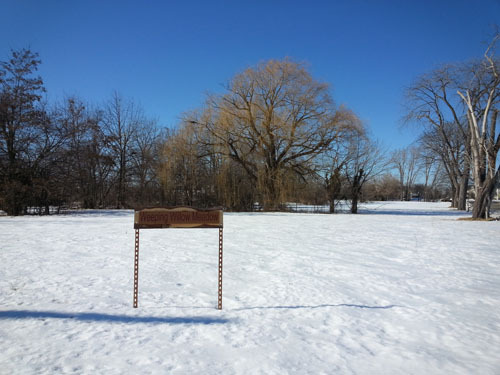 When this field is gone, where will people take their dogs to play? Maybe when Dan Gilbert is done installing the new art district, he’ll put in a fancy dog park somewhere, and we can all just drive over there, because that’s how to create a vibrant community. Tough luck to everyone else who simply wanted a piece of greenspace in their neighborhood, leaves to crunch through in the fall, and in all seasons a rare local breath of fresh air. Watch out, Weeping Willow Meadow! A name does not guarantee you’ll be remembered. 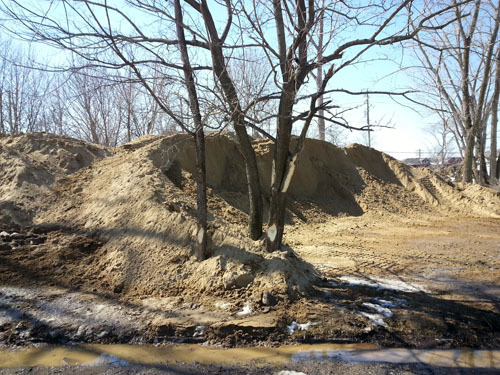 This week, dump trucks have been arriving laden with heap after heap of dirt and gravel, the excavated foundations of housing elsewhere all over lots not slated to be developed until well into the future. Trees wait waist-deep in mud. It seems torturous. And this is a good use of greenspace, this hotbed of unfulfilled dreams. Whew! Our friendly development cheerleaders have made it to the game. Curbed reports today on a new housing slated to break ground somewhere in “Southwest Midtown” by none other than the Slavik Management, part of the team of hole-diggers disturbing Woodbridge Farm with their foundation voids and willy-nilly accumulations. Curbed speculates that the new arm of Vinyl Village will go in at the sadly defunct Wigle Recreation Center on the east side of the Lodge, conveniently connected to Vinyl Village proper by the Selden pedestrian bridge. If Curbed is correct, this is devastating news not only for greenspace enthusiasts making the trek from Woodbridge to Midtown but also the teams who practice sports there all summer. Please see the comments for important notes regarding the boundaries of these historic districts and encroaching developments. Construction fence unrolled to the brink of the sidewalk, this is the last time someone will stand on this ground, until we tear these down and do it all over again. 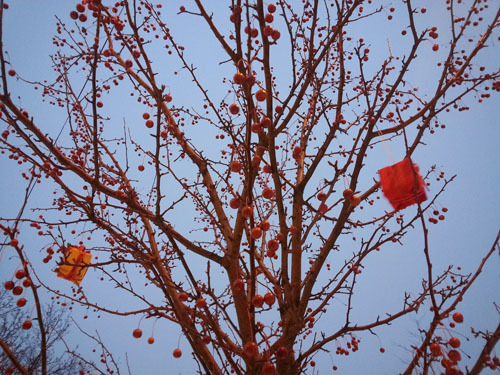 Recent walks have been full of sightings of things decorated for Christmas, people out decorating for Christmas (inflating a large pink and white Hello Kitty may take the cake as most festive), and birds eyeing decorations for housing opportunities. 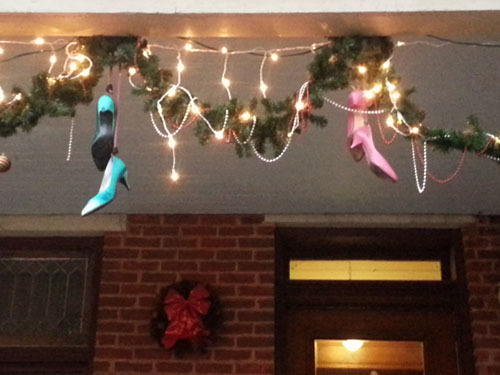 These decorations were right up our alley, although the footwear seemed a bit ambitious given the weather. 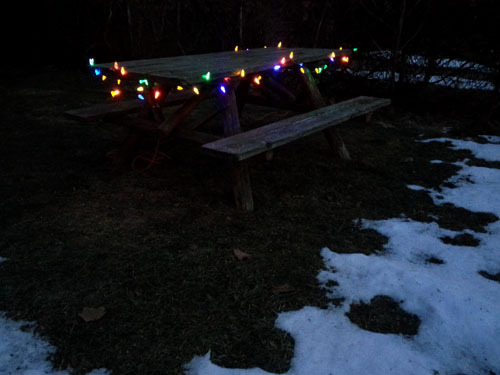 As the holidays begin, #25daysofchristmaslights is drawing to a close. Here’s a last-minute one that’s by no means the most ostentatious, but charming nonetheless. 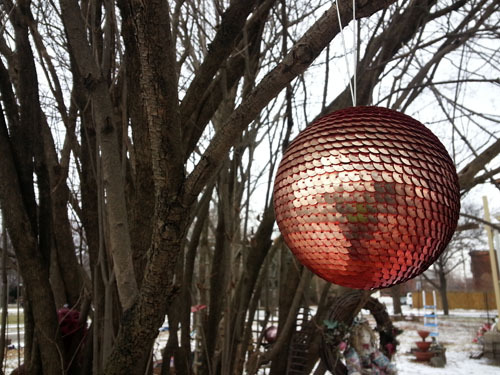 Which holiday displays have been brightening up your walks?